An outdoor antique market in one of city squares. 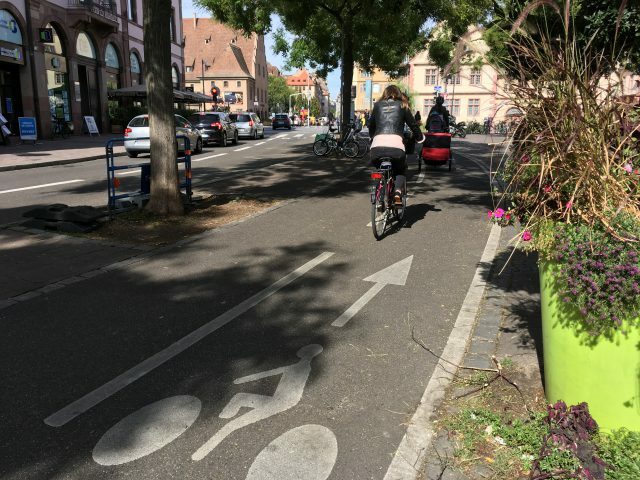 There are bike lanes throughout the city and bike riders everywhere! 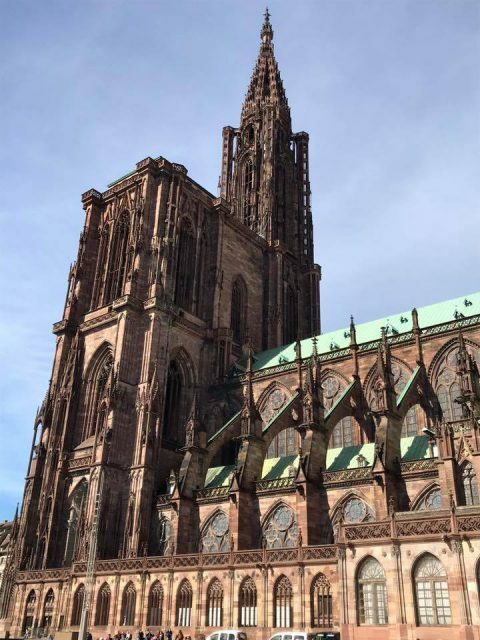 The south side of the spectacular Strasbourg Cathedral (Cathédrale Notre-Dame), which was completed in 1439. The cathedral’s west front is decorated with thousands of figures. The single spire is the cathedral’s most defining feature. You can orient yourself to the spire from just about anywhere in the central city. 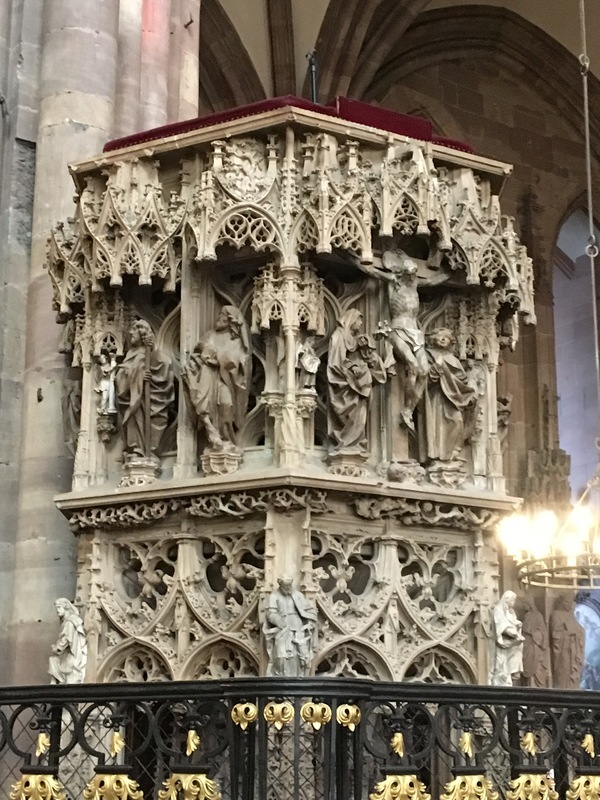 The intricately carved pulpit dates from 1486. 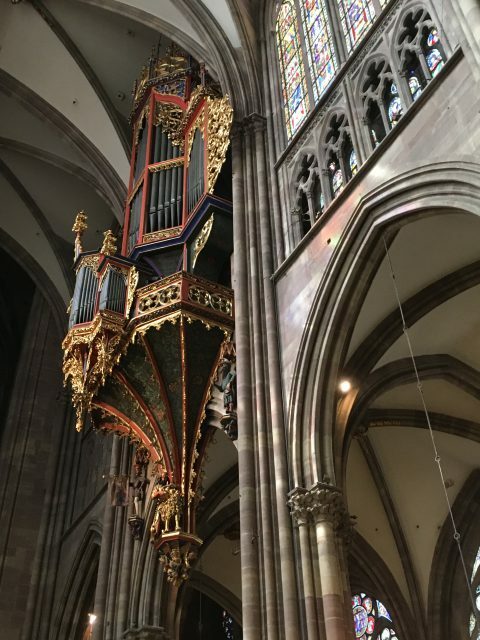 The elaborate pipe organ hangs high above the sanctuary. It was added in 1878. The River Ill runs through the central city, and has wide paths on each side for strolling. 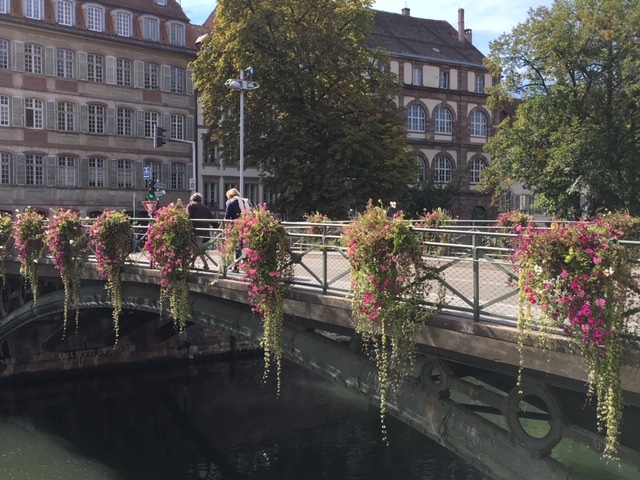 Several of the bridges are bedecked with flowers. 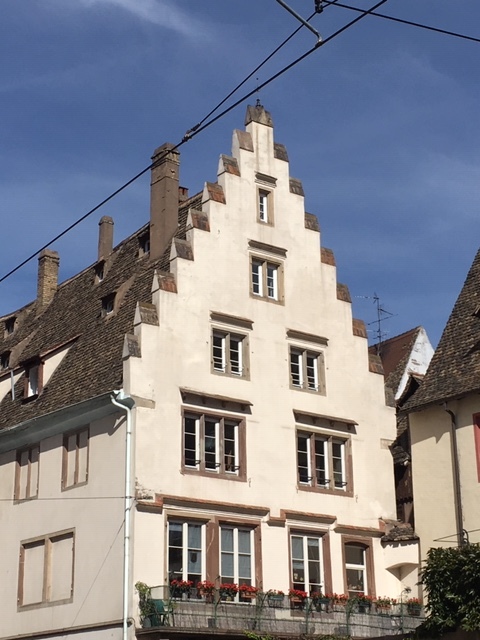 Strasbourg’s distinctive architecture fills the central city and lines the river. 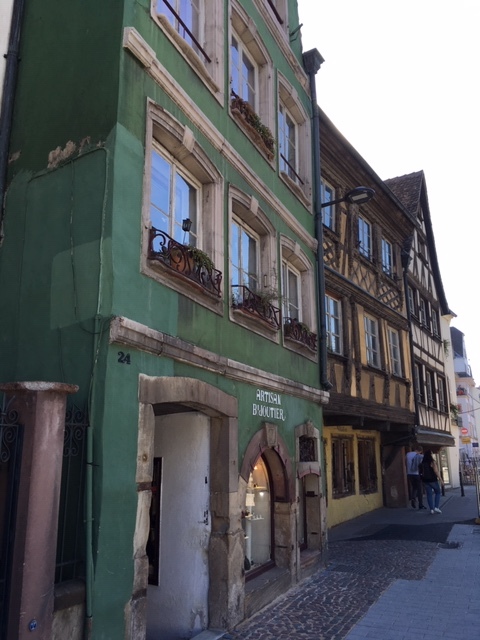 Fifteenth century buildings are still being used today. Interesting rooflines are not difficult to find. Outdoor restaurants can be found throughout the central city. 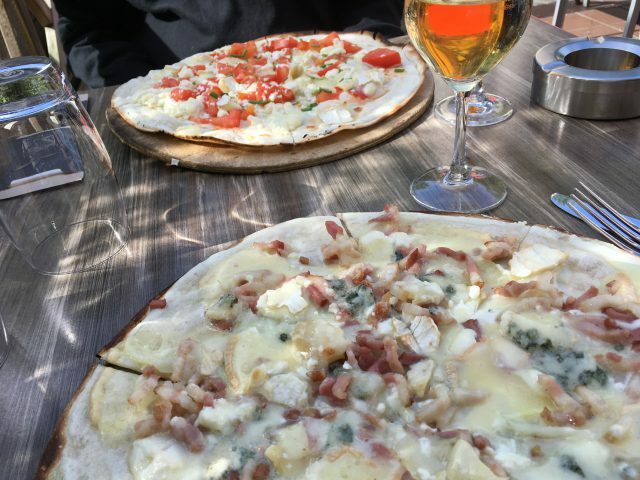 Tarte flambée, a speciality of the Alsace region, are very popular. An extremely thin crust is topped with creme fraiche, thinly sliced onions and bacon, with other toppings added according to taste, then baked in a wood-fire oven. 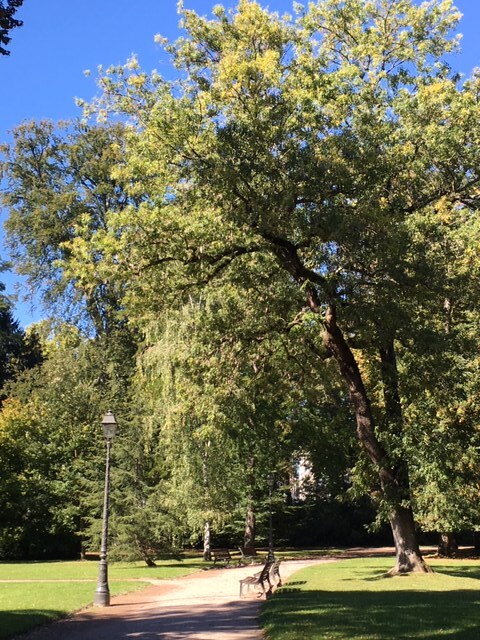 On the north side of the city is Parc de l’Orangerie, the “lungs of Strasbourg.” The park contains huge, old trees of many varieties, paths for strolling, formal gardens, sculptures, a lake, and even a small zoo. 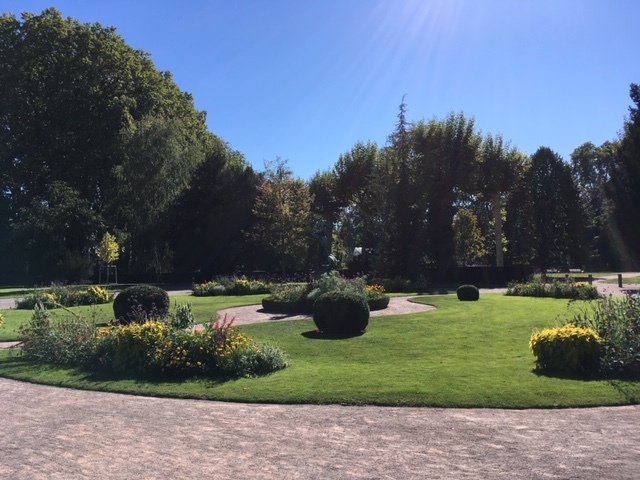 A formal garden space in the park. The park area was originally intended to be an orange grove. 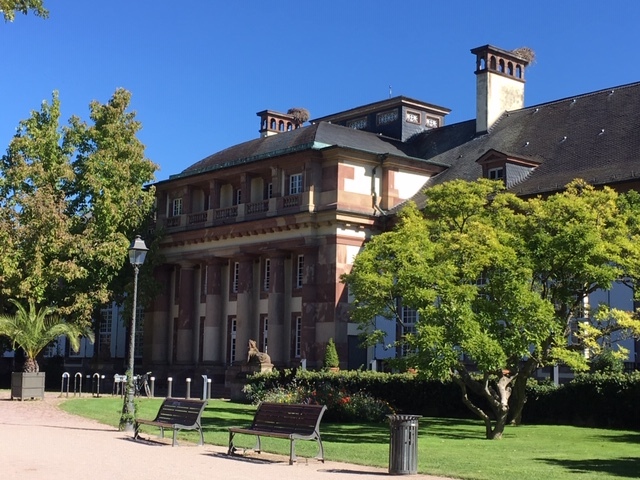 The residence was dedicated to Empress Josephine in 1804. 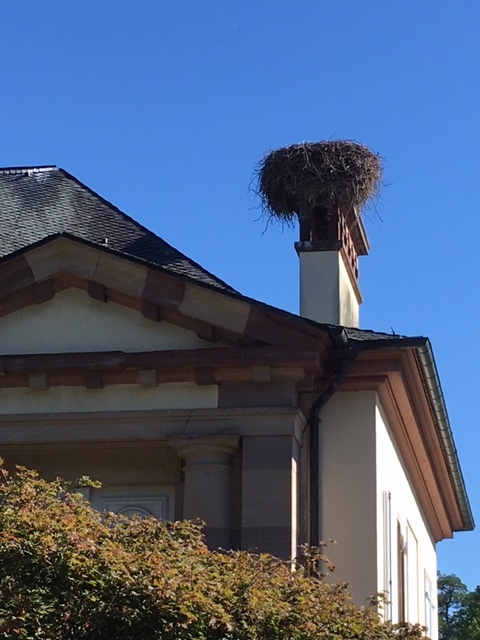 There are storks’ nests on each of the residence’s chimneys! 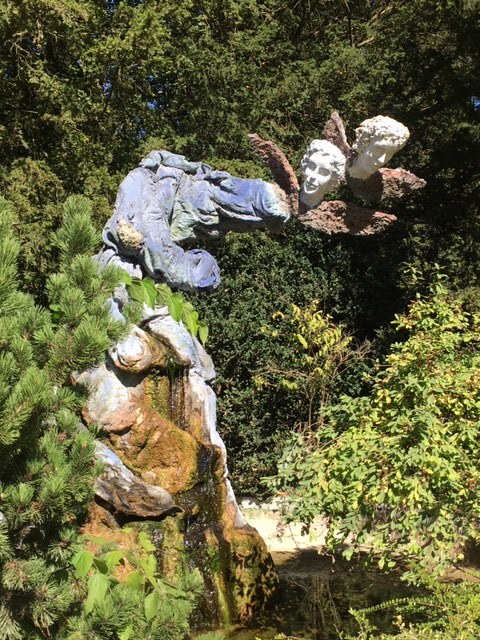 This sculpture sits across from the residence. It is constructed of concrete over natural rock – the name is unknown. Across the street from the park is the European Parliament, the legislative seat of the European Union. The flags of each member nation fly in front. We were unable to see much of the campus because lots of construction is currently going on – trucks and other equipment blocked almost ever road. We have so far found the city very easy to navigate, either by walking, tram, or bus, and we’re looking forward to discovering more in the coming weeks! Love your photo essay. The words “built to last” are an understatement when looking at the age of those buildings. Glad you re enjoying the city. I was genuinely surprised the number of old buildings there are that are still being used. For some reason I thought there were just a few (that got their picture taken by a whole lot of people. One thing I love here in France (and probably all of Europe is that buildings typically have businesses on the ground floor and then apartments and offices above – no wasted space. So, there might be shops or a restaurant or cafe on the ground floor, and then several floors of apartments above. They do the same in Hong Kong and Japan, where space is at a premium. It really has made me think about how much space we waste in the U.S. and why we have so much sprawl. I am loving the travelogue and the photos! What a beautiful city. The gardens are to die for. And the cathedrals in Europe are always awe inspiring – especially the thought of constructing them without our modern equipment. Amazing. 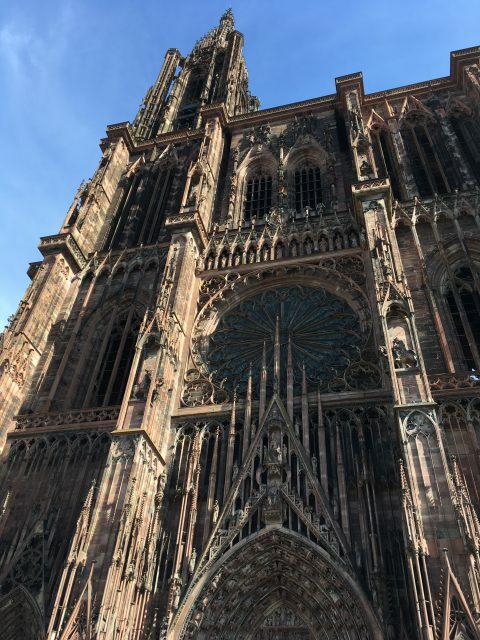 We have only been here a few days, but Strasbourg is already our favorite city. The downtown is charming, it’s easy to get around, prices are reasonable, and people walk or ride bikes everywhere. The cathedral is breathtaking. For a long time it was the tallest building in Europe. Inside of the cathedral there was an old portable ladder that had been used to work on the inside. It could be wheeled around, and the ladder placed at different angles depending on the work to be done. Now days they use scaffolding, of course (we saw plenty of that). All of the carvings on the outside of the church give the impression of laceiness – I can’t imagine what it was like being up so high, carving away back when it was built, and achieving such delicacy. I’m glad you’ll be staying there for a few weeks. The pictures are amazing! I’m always in awe of the architecture. It certainly is a lost art. It’s interesting how people in other countries get around. In Europe they sure do walk and ride their bikes a lot more than we do here. We’re too sedentary. Well, enjoy and I look forward to more pictures. 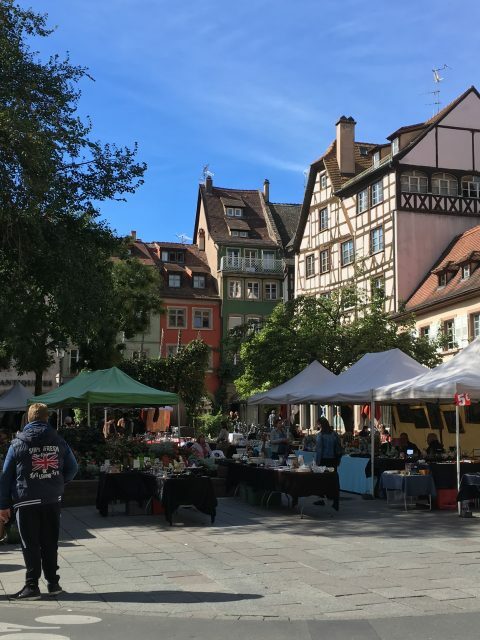 We’re happy to be here for a while – we like Strasbourg more and more each day we’re here. We’ve been getting more sleep, and both Brett and I are enjoying not having to get up and go-go-go all day. Yesterday we just strolled around the neighborhood, went to the ATM, had some ice cream, stopped and the bakery and a couple of grocery stores and that was it. We still walked nearly a mile and a half which is way more than we ever did back in the U.S.
We have laundry to do today (Saturday) and then may walk around the central city some more and seeing what’s out there. 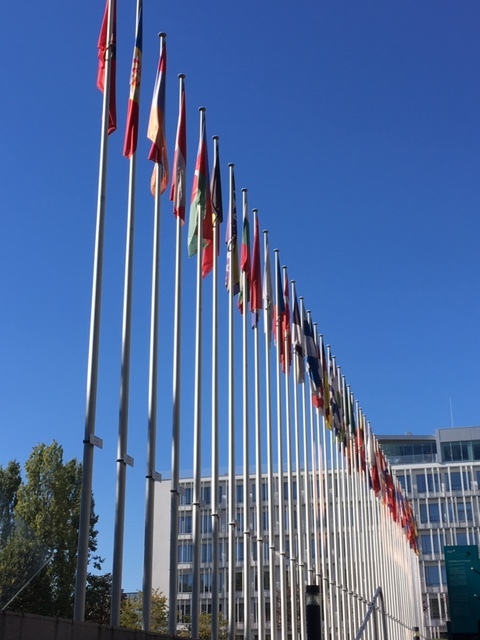 We head to Switzerland for three days on Monday, and after we get back we want to explore the park some more and also see if we can get a tour through the European Parliament, or if not, just get out for a better look at the main meeting area. But I like that if we don’t feel like doing anything, that’s OK too!